Can We Kick out Corruption From the World Cup and Beyond? Excitement for the Word Cup in Brazil is building, but the tournament has got off to a bad start even before the first ball has been kicked. Stadiums, airports and roads are still not finished, with just a day to go until the opening ceremony; and over 10,000 of Brazil's poorest people marched in Sao Paulo recently in protest against the cost of the event when so many Brazilians live in poverty. At the heart of these problems for football's biggest tournament is corruption -- which is thought to have totaled $53 billion in Brazil, last year alone. That's more than the GDP of many of the countries playing in the cup. On the field, players and referees are also getting caught up in match fixing scandals. Sadly, at the national level in many countries domestic leagues also suffer from similar problems. There are quick fixes that can be made to make sure this World Cup is a success. But real change requires long-term efforts to fight corruption and build integrity among the youth around the world who will be the soccer stars and decision-makers of the future. For the past six months, we've been getting to the heart of these challenges through a grassroots program called Kick-Out Corruption. In Liberia -- often ranked as one of the most corrupt countries in the world -- the Accountability Lab has developed a series of soccer-based games for kids, each of which demonstrate lessons around issues of corruption, integrity, fair play and personal responsibility. L.A.C.E.S. -- has also set up soccer leagues in four low-income communities to help develop teamwork and leadership and is using these Kick Out Corruption games as part of its coaching curriculum. Now we are partnering with support from the Games 4 Good Foundation -- which harnesses sport for change -- to roll this program out further. Kick Out Corruption works because it makes critical issues understandable to young people who want to play. In one game, for example, the referee is biased towards a particular team -- demonstrating the larger problems with favoritism. In another, all players wear the same color bibs making it hard to work with teammates -- indicating the importance of diversity and inclusion. In a third, players who lose the ball during play have to stop and answer questions relating to corruption issues. In between sessions, the players learn about other tools they can use to help build accountability and integrity in their communities. 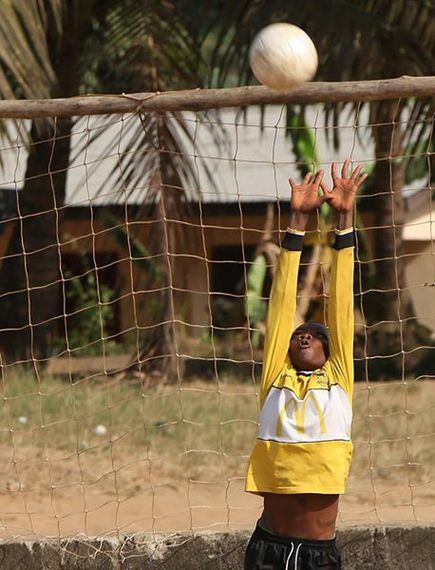 Footballers are passionate in Liberia like everywhere else -- often, the players become deeply frustrated when they feel the games are not fair, but realize afterwards that this same passion can be channeled into changing their society and fighting corruption off the field. We recently conducted a survey of past participants who articulated that they feel the program has the power "to change the story of their country" and "that accountability doesn't start at the top- everybody needs to do something." It is this sense of personal responsibility that grows out of the program that is so important for long-term change in a country like Liberia. So far we've trained over 25 coaches in Kick-Out Corruption techniques in Liberia, and have worked with over 500 youths through the program. In the future we hope to spread the techniques to a number of other West African countries -- like Nigeria and Ghana -- that are playing in the World Cup. By the time their young stars are ready to play in or manage the global competitions of the future, decisions will be made far more honestly -- for the good of the game and for soccer fans everywhere.